When Edith and W.E.C. Eustis moved into their new home, their twin sons Fred and Gus were just two years old. The family employed a nurse to help care for the children. 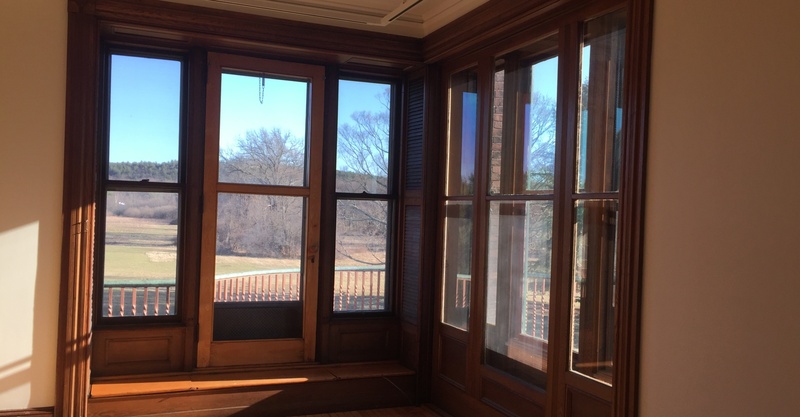 The day nursery, connected to the principal bed chamber via the dressing room, features a huge corner window providing wonderful views toward the Blue Hills. The capacious balcony allowed for the children to get fresh air without having to go downstairs. 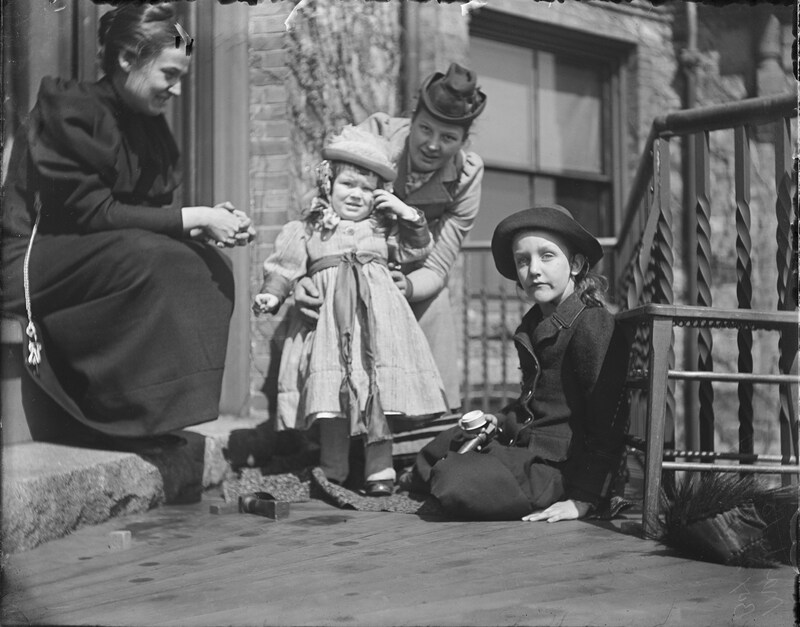 Pictured, left to right: Edith Eustis, John Jeffries (son of W.E.C.’s sister), unknown woman (possibly Emily Eustis Jeffries), and Mary Eustis. The children slept in the night nursery until they were old enough to move into private rooms on the third floor. A dumbwaiter originating in the china closet ran directly to this room, bringing meals upstairs for the children before they were allowed in the dining room. A bathroom was installed nearby for convenience. 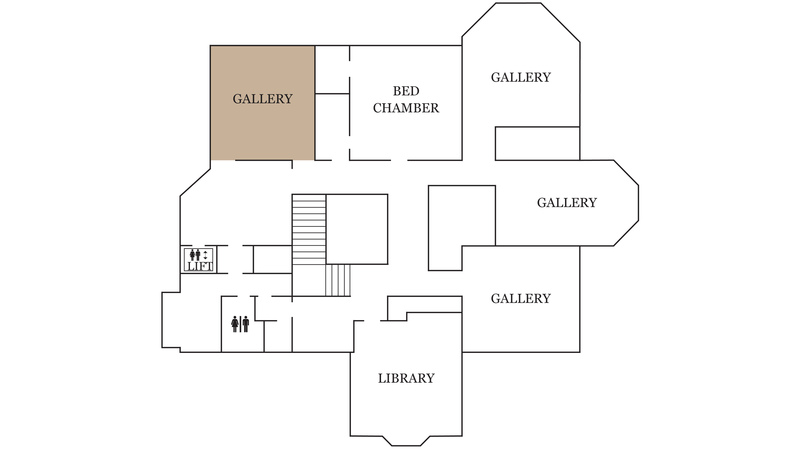 The nurse’s room, one of four servant bedrooms on this floor, was connected to the night nursery by a private passageway (seen in the bottom left of the image below). While the fireplaces throughout the house are all unique, the tiles decorating the fireplaces in the nurseries are more whimsical. The night nursery features tiles from two English ceramic companies popular while the house was being built. The blue tiles come from a Wedgwood series depicting months of the year, which was designed in 1878 by Helen J.A. Miles. 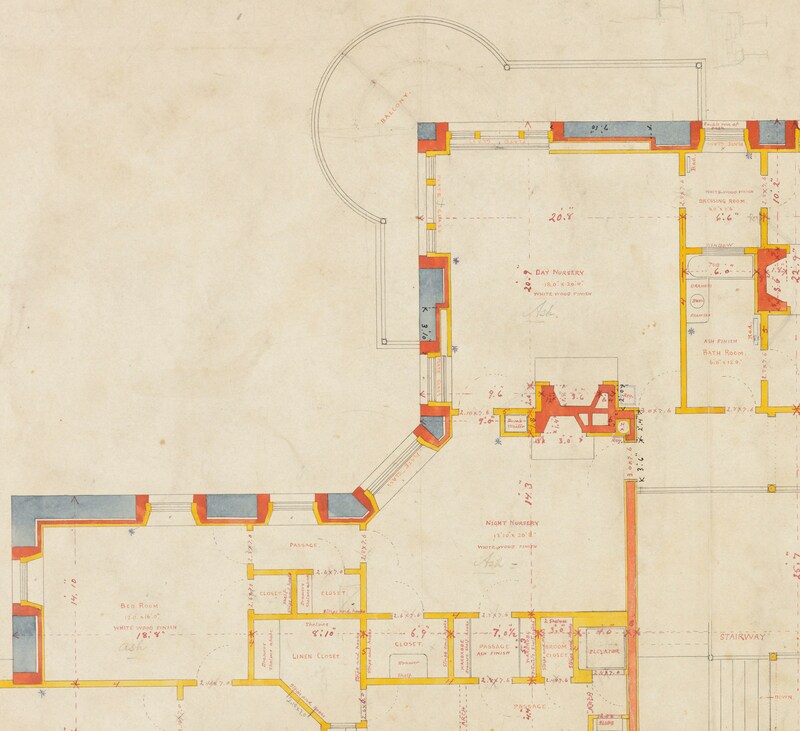 She was a watercolorist and book illustrator who provided many designs for tiles for Wedgwood starting in the 1870s. It is unclear why only eight months are included or why they were placed out of calendar order. The brown tiles are the “Animals of the Farm” series from Minton China Works, designed by William Wise who worked for the company from 1876 to 1889. These scenes show the work of an exceptionally skilled designer/engraver in the Realistic style popular at the time. 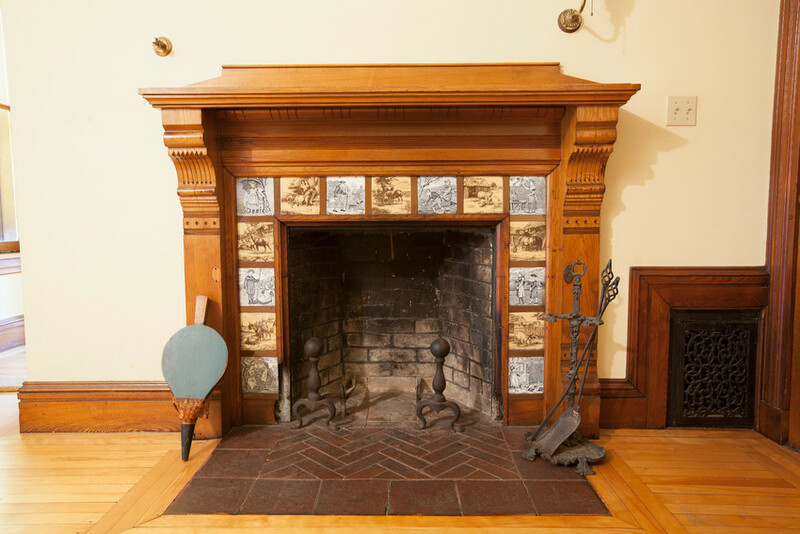 The tiles surrounding the fireplace of the day nursery feature nursery rhymes and fairy tales, a common theme for children’s rooms in the 19th century. Their origin is a bit of a mystery because there is no signature on the front and no extra tiles were found to examine the back for a maker’s mark. It is likely that they are hand-painted (rather than mass produced transfer-ware like the night nursery tiles) and could have been done locally or even by a family member. 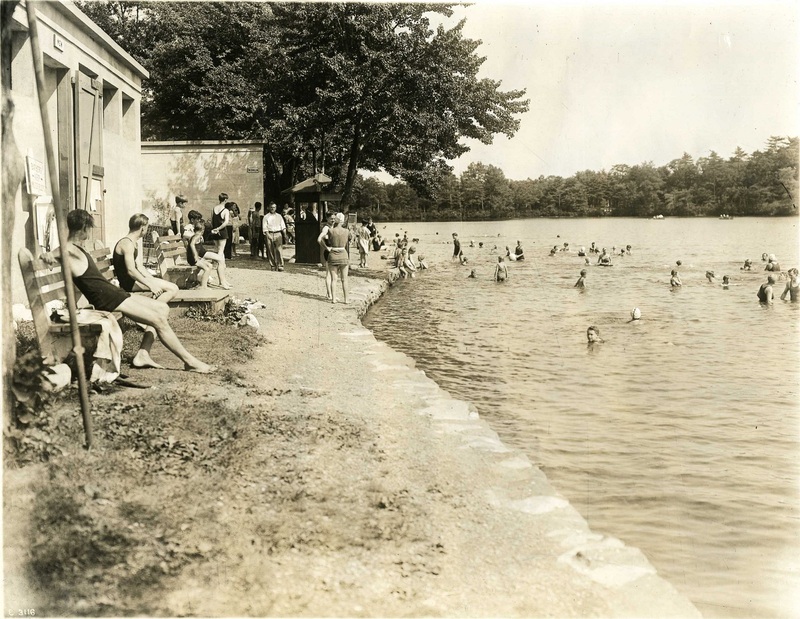 When the Eustis Estate was built in 1878 at the base of the Blue Hills, the hills were primarily private property, known locally for their natural beauty. When the Blue Hills Reservation was created in 1893, the Eustises lost approximately 118 acres of land through eminent domain. Another 812 acres were taken from the Hemenways and other neighbors. 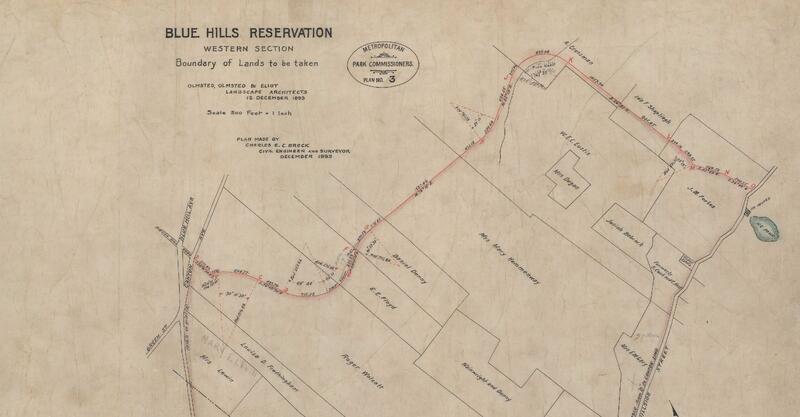 This map shows the land that was taken. Today the Blue Hills Reservation encompasses more than 7,000 acres.